A Balanced Approach to Cleansing Your Scalp for Spring. Our Top Tips this week from the Pello Hairdressing Team for a clean scalp and better hair day. Spring cleaning is equally as important for your body as it is to cleaning out your wardrobe. We're all on a quest in January to detox and often put all our focus on our eating pattern, but we forget that the total over indulgence of December also takes a serious toll on our hair. The lack of nutrients substituted by sugar,going into our body for the lead up to the bell’s,has a major impact on our skin and hair as we come to terms with the New Year. SO LET'S START OUR NEW HAIR CARE REGIME WITH A HEALTHY SCALP. Here at Pello Hairdressing as an Exclusive Aveda hair salon we take a balanced approach to beauty,and this week here are our tips on how to deal with your non-shampoo days and how to keep your dry shampoo habits in check. Now let's face it this is a staple addition for the “on the go girls” must have hair accessory .Dry shampoo is no longer seen as the lazy day substitute for hitting the snooze button. It's become a universal favourite known for its versatility . It's great for adding texture to a third day blowdry. It's fantastic for extending blowouts and works a treat for adding oomph to updos and ponies. Besides anyone who manically scrub their hair once or twice a day will just strip their hair of all its natural oils ? Right or wrong ? Treat your hair and scalp as separate entities. CLEANSE YOUR SCALP AND SHAMPOO YOUR HAIR. As rule 3 to 4 days is the MAX you should go without washing your hair …..depending on you hair type and texture.Everyone scalp is also different. Even if the trend is not to wash as often it doesn't mean you need to follow it! It's better to be a leader than a follower. Promote microcirculation by massaging your scalp daily to loosen surface impurities. Use a scalp brush to clean your scalp just as you would to dry brush your skin. To do this effectively you need a brush that's designed specially for that purpose. 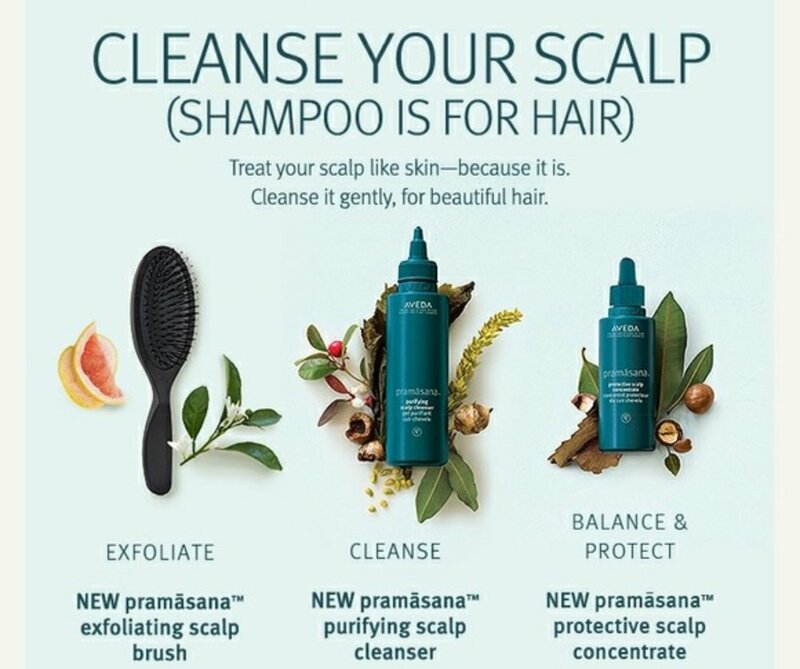 We would recommend the Pramasana Exfoliation Scalp Brush.This uniquely designed brush has special loops so that you can move the brush in gentle circular motions without tangling the hair. You can use this brush daily even when you don't shampoo your hair. MAKE THE MOST OF YOUR LIFESTYLE. Staying fit and healthy is crucial to our well being and a balanced lifestyle. Working out has a powerful positive effect on our mind , body and soul.However make sure that the sweat build up during exercise doesn't become an issue. Using a scalp hair care collection will address the sebum production and accumulation and dry shampoo will help absorb the excess impurities. USING DRY SHAMPOO AND DRY CONDITIONER. When you do need to skip a wash , don't forget that your scalp and your hair have different needs. Use dry shampoo at the root to help absorb the excess impurities but your hair needs to be cleaned and you should look for a formula that offers more conditioning and softness.You can use a dry shampoo on the root and dry conditioner mid roots to end. MAKE THE MOST OF SHAMPOO DAYS. Develop a routine for your scalp that deeply cleanses, balances and protects.Make sure to treat the scalp with exfoliant preferably with ingredients that contain wintergreen derived salicylic acid derived to promote cell turnover. Follow this by shampooing your hair. Finally just like your skin routine apply a scalp serum to your scalp to help balance sebum levels and protect against environmental factors such as pollution and other free radicals. Finally make sure you stick to your new scalp hair care regime. If your going to invest the money invest the time…..
That's it for our top tips this week from the Pello Hairdressing team. We're based in Letterkenny Shopping Centre and We are an exclusive Aveda salon . We're open every Monday-Saturday AND closed Sunday's. We also have a no appointment necessary policy.